On the Mac, you may know that a right-click on just about anything can bring up a “Search the web” feature. When chosen, the selected term or phrase, whether from an app or from another web browser, gets quickly searched for using your default browser. This is great if you’re reading something and you want more information about a mentioned subject or topic, but the iPhone and iPad don’t have this ability… or so many thought! It turns out there is a way to perform a “Search the web” function within iOS on just about anything, it’s just a bit indirect and somewhat hidden in a place where many users just wouldn’t look. Beliee it or not, the term search feature is accessible from the popular tap-to-define bundled dictionary, native to iOS. If you’re confused, don’t be, it’s super easy to use. 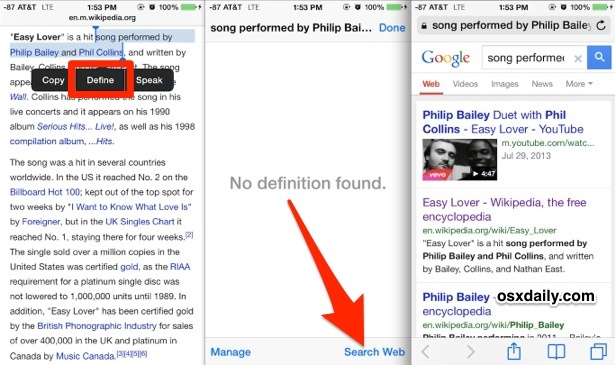 The screen shot above demonstrates this using a phrase of text, selected by using the tap-and-hold trick, then expanding the selection box to include the desired phrase to search the web for. Then, just choose “Define” (knowing it won’t be defined) and the “Search Web” option in the corner, and into Safari with Google the phrase goes. On a related note, if the word, phrase, or term you’re tapping on should be defined but it isn’t found, you probably just need to add a new dictionary with more definitions available. Apple offers a variety of them through iOS, and new definition files can be downloaded rather quickly, even for multiple languages. So if you were ever wondering how to easily search the web from iOS, now you know a way! Hopefully Apple will implement a “Search” option in the normal pop-up menu soon, but until then, this excellent trick found by CultOfMac does the trick.